Supplemented with frankincense and sweet orange pure essential oils, this mallow is redolent with cocoa butter and is designed to leave you feeling fruity and bubbly! Sodium Bicarbonate, Theobroma Cacao (Cocoa) Seed Butter, Citric Acid, Zea Mays (Corn) Starch, Sodium Lauryl Sulfate, Parfum (Fragrance), Vaccinum Macrocarpon (Cranberry) Seed, Shinus Terebethifolius (Redberry) Fruit, Citrus Aurantium Dulcis (Sweet Orange) Peel Oil, Boswelia Carterii (Frankincense) Resin Oil, Benzyl Alcohol, Citronellol, Limonene, Linalool. Cranberry but not for sauce! The scent of this melt before you use it is so lovely, reminds me of cranberry. When it melts, little red seeds come out of it and fill the bath up as the red balls on the top float about too. 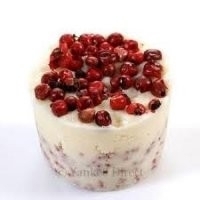 The scent is intensified and it is so sweet and berry like, more like fresh cranberries, delicious! Nice light film of oil on the top that sinks into your skin, moisturising it. No need for a moisturiser afterwards. The scent stays on the skin until next bath too! Looks really nice and smells delightful. 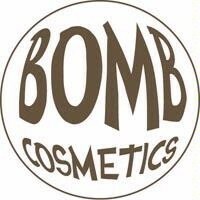 "Bomb cosmetics make the prettiest bath things and when you buy them 3 for £6 they become more reasonable. This smells lovely and fruity ,..."